Photograph taken in aquaria on a black substrate, so the sandy colours that merge so well with the sand can be distinguished. 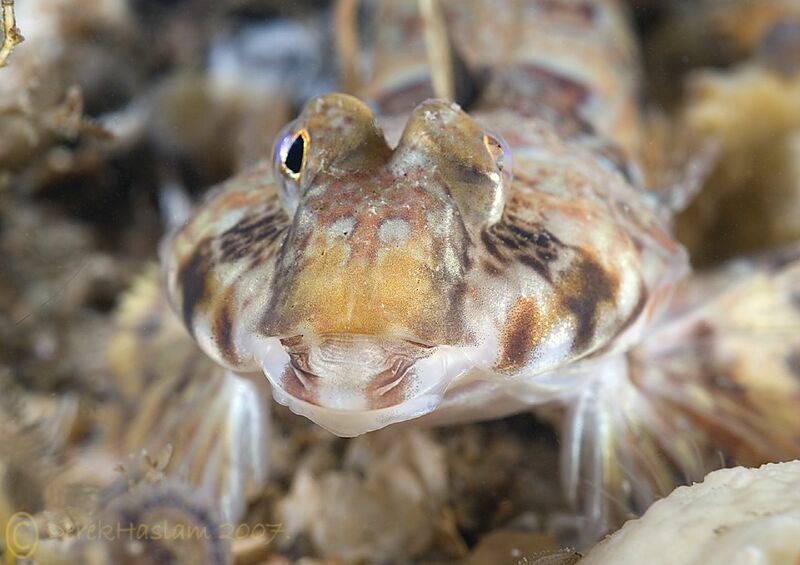 I watched a 100 mm (4 in) Dragonet and several smaller ones hunting on the sand close to the pier; sand-coloured fish with darker mottlings, difficult to spot when motionless. Seen from above, the large specimen was distinctly triangular, widest at the head and tapering steadily backwards (most books only show side views). The head was low and apparently flat underneath, with a wide mouth and big eyes. The dorsal fins were folded flat on its back, and the tail fin was also held closed. Its rather protruberant eyes must have given it a good view of the surrounding seabed as it swam slowly and erratically along, occasionally pouncing on a tiny transparent shrimp. While moving slowly, it swam barely clear of the bottom, settling every few inches (about 50 mm) on to the sand, and using its huge splayed pectoral fins for propulsion; only when alarmed did it dart away for 60 cm or so with beats of the tail, then it settled on to the sand again, almost invisible. At no time were the big dorsal and verbal fins, so distinctive in book illustrations, erected; and the colour was its practical everyday garb, not the male's breeding colours usually illustrated. 50% juveniles collected alive at Worthing in September 1998 had much darker heads (look carefully at the photograph). Aquarium observation indicate that the brown heads can appear and disappear, which happens in one fish. On the other fish the darker ahead remains constant. 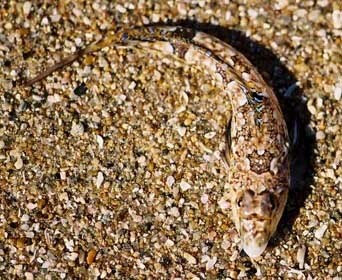 This fish has eyes on the top and a shape like the Mudskipper species of the tropical mangrove habitats. Their courtship is quite elaborate, which is unusual in British fish. The male I watched approached the female, then spread his pectoral fins and erected both dorsal fins, showing off their colours, at the same time lifting his head and opening his mouth very wide; he did this repeatedly. Had the female responded, the courtship would, I am told, have continued with increasing excitement until the two fish swam vertically upwards, undersides together with the female resting on the male's pectoral fins, and released their eggs and sperm to be fertilised between their bodies before it drifted away. Yellow and blue fish caught at Marchwood (on the Solent/RiverTest) opposite the Southampton Container Docks. The dorsal fin is 4-5inch long. 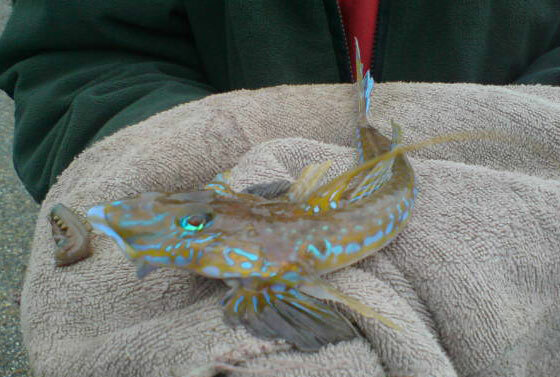 Young fish are sand shifters, filtering small organisms from ingested sand. Adults eat small crustaceans and worms, Carrion probably not an important part of its diet and may not be recognised as food. In captivity, they started feeding on crushed frozen prawn after four days. 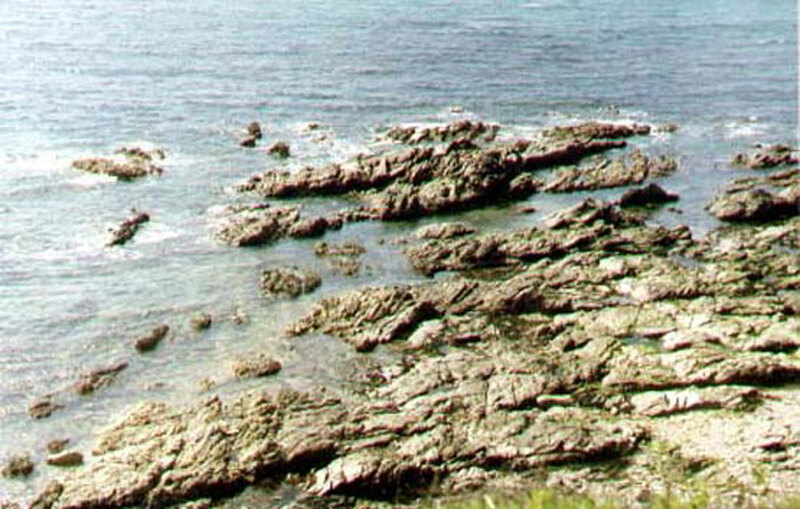 Shallow water to 30 metres, occasionally deeper. Juveniles intertidal, although all Sussex specimens were found in Autumn, as late as October. Habitually buries completely under the sand. Even on pools on the shore, the presence of this fish can go undetected. Head and eyes only may protrude and fish may quickly emerge from hiding to feed. Protruberant eyes revolve and appear very alert to the smallest movement.